I have had this Spykee robot for a while now, had encountered some issues, and decided to fix it. Spykee is a “toy” robot that is suprisingly sophisticated. It has a video camera and microphone, and can be controlled remotely from a computer via local WiFi, or over the Internet. However, it has a design flaw in the battery charging mechanism that overcharges and soon destroys the included battery, getting to the point where you can only operate the robot for 10 minutes. The built-in WiFi antenna is cheap – a piece of PCB with etched traces – so the range is very poor. I fixed both of these issues very quickly: for the WiFi range issue, I ordered an RP-SMA to UFL pigtail connector. This is a fancy wire that connects to the WiFi connection on the robot’s motherboard on one end, and to an external WiFi antenna on the other. I ordered this one. Disassembled the robot, unplugged the internal WiFi antenna, and plugged in the pigtail. Drilled a hole in the case, on the left side near the top, and threaded the RP-SMA connector through. The antenna, from a defunct D-Link router, just screwed on. You can probably use higher power antennas as well, as long as it has an RP-SMA connector. For the power issue, I did a little research. It turns out that Spykee runs fine on a 12V power supply, not just the 9.6V battery that it ships with. I had good experience with Lithium-Polymer batteries I found on eBay, that go up to a whopping 6800MaH (vs. 1600MaH at best for the factory battery). I use the same battery for powering the LEDs on my baby’s stroller, and it has been rock solid. So I ordered this one from ebay, and set about adapting it to the robot. I wanted the mod to be as reversible and low-impact as possible, so I looked at the battery connector inside the robot (Tamiya style), cut the equivalent battery-side connector off a dead battery, and soldered it via some wires to a standard 2.1mm power jack from Radio Shack. I drilled a hole in the robot case to accomodate the jack, and plugged the other end into the robot’s existing battery connector. 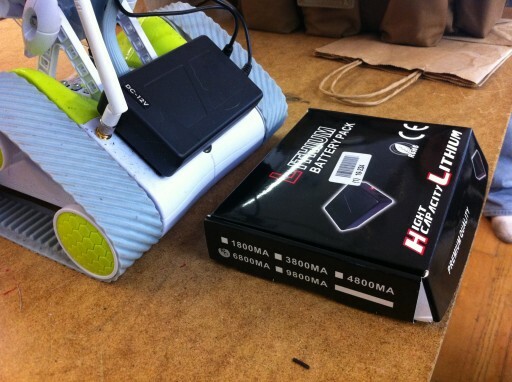 The battery attaches to the robot using Velcro adhesive strips. I can revert to the “factory” configuration by just unplugging the new cable, and plugging in the old battery. Results of all this? 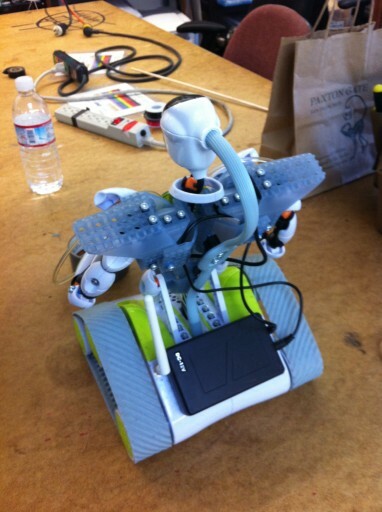 The robot can now be run very actively for over two hours at a time, at high speed. WiFi range is roughly 25% better, the robot can now roam freely all over the apartment without losing the connection. 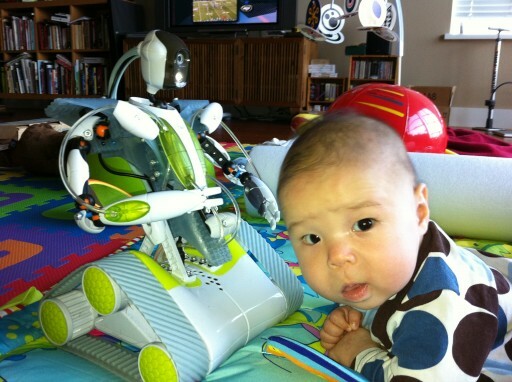 It is now a far more practical proposition to use the robot to play with my son!